Can you deny the experience of painful injection? Since birth to the deathbed, injections play an important role in our life. Vaccination, immunisation, various ailments need undesirable injections and we have to accept it. In some diseases like diabetes, hormonal diseases etc. self-injection is a discipline, required several times in a day on regular basis throughout the life. 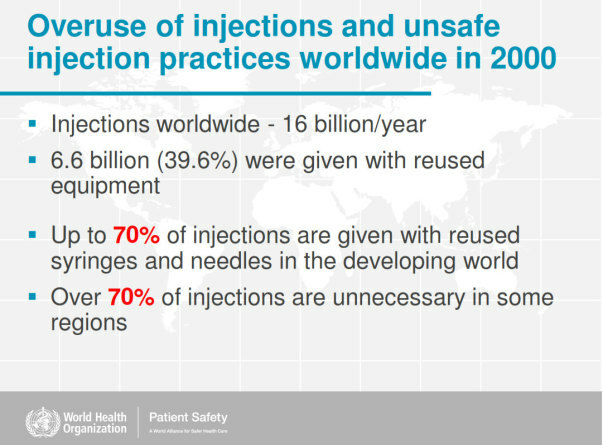 More than 40 billion injections are used annually worldwide. 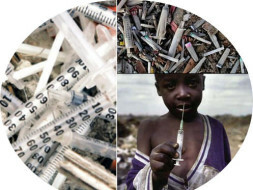 Each injection needs a new syringe every time, which is discarded after use along with the drug container. What happens to this unsafe syringe after use? It does not only generates more than billion tons of unsafe bio-medical waste but also claims lives of more than 40 million people annually worldwide and also results in most dreadful diseases like HIV/AIDS, Hepatitis B, Hepatitis C, gonorrhoea, typhus, herpes, malaria, Rocky Mountain spotted fever, syphilis, and tuberculosis and other communicable diseases. This data is more dreadful than the world’s most infamous famine erupted in China in 1958-62, which claimed more than 40 million lives, but once in history. This range of dreadful data continuously goes on increasing with the decreasing economy of country, which means minimum in developed countries and maximum in poorest countries. Simultaneously, it ranges from minimum to riches but maximum to the poorest. What does WHO say in its 2002 Report? WHO report entitled "The burden of unsafe injections worldwide: highlights on recent improvements and areas requiring urgent attention"
What causes this dreadful menace? We should know, the unsafe injections are the primary potential source and root-cause of this dreadful menace. The unsafe injections include the “used syringes”. The syringes once used are potentially unsafe due to exposed needles. On one hand, the blood stains on the exposed needle bear the blood-borne pathogens, which interact with varieties of harmful bacteria and grow rapidly. The decomposition of blood stains creates a safe-haven to these deadly blood-borne pathogens with increasing duration of exposure in air. The varieties of such bacteria/viruses available in decomposing blood stains contaminate the atmosphere and transmit numerous communicable diseases through the atmosphere. Thus, the exposed contaminated needles of used syringes are bound to spread the communicable diseases. On the other hand, the exposed needles extensively pose a high risk of Needle Stick Injuries (NSI) from the healthcare worker/user to the persons actively involved in collecting, storing, transporting and otherwise involved in recycling of such used unsafe syringes having exposed contaminated needles bearing dangerous blood-borne pathogens and bacteria/viruses in decomposing or decomposed blood-stains. Thus, exposed contaminated needles of used syringes and the Needle Stick Injuries (NSI) caused by such syringes, both are primary source of the most dreadful diseases like HIV/AIDS, Hepatitis B, Hepatitis C, gonorrhoea, typhus, herpes, malaria, Rocky Mountain spotted fever, syphilis, and tuberculosis and other communicable diseases. Hence, it is strictly advised not to reuse the syringe once used. Whether the use of an entirely new syringe is safe? Of course! It is safe, provided it is really a new and un-used syringe. But, the new package of syringe is not the guarantee of being the syringe un-used. What is the magic behind it? A large chunk of the used syringes, collected from the various clinics, hospitals or healthcare centers are not really recycled, but are simply washed and repacked in the name of ‘entirely new syringes’. We pay the higher cost of new syringes and use such ‘reused packed syringes’. Thus some unscrupulous and dishonest profit-mongers are actively engaged in reaping a huge amount of profit and we are not aware at all. How to curb this threat????? The WHO is waging full-scale war, literally a crusade, for last two decades against alarming menace of unsafe injections causing AIDS/HIV, Hepatitis B&C etc., particularly the Needle Stick Injuries (NSI), which is the chief source of such other communicable diseases. The rapidly growing piles of hazardous bio-medical waste generated by the disposed syringes are also the matter of great concern. The entire healthcare industry including various R&D institutions are also seriously putting herculean efforts to design safe syringes compatible to WHO guidelines. Millions of dollars are being spent to successfully curve this menace in various ways but the problem is not addressed effectively. Completely prevent the reuse of syringes. Completely prevent the Needle Stick injuries. What are the safe syringes? In the name of safe syringes, we are merely using Auto-disable (AD) syringes to some extent (less than 1%). These syringes are locked after completion of injection and cannot be re-used subsequently. Whether (AD) safe syringes may curb this dreadful menace? 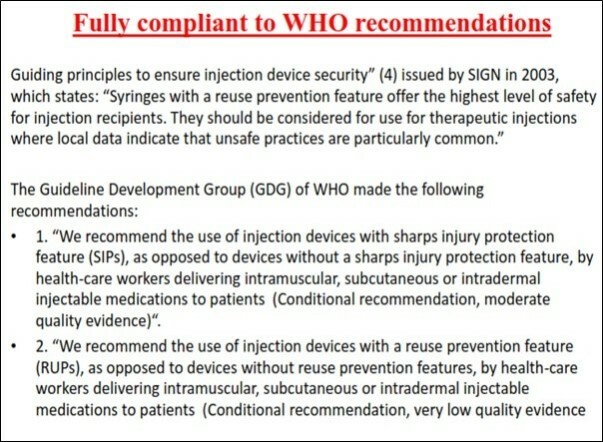 The safe syringes may only prevent the reuse of syringes. They may not avoid the Needle Stick Injuries caused by the used syringes from the health-care-workers to the persons actively involved in collecting, storing, transporting and otherwise involved in recycling of such used syringes. Besides, the exposed contaminated needles of used syringes are bound to spread the communicable diseases. Then, what is the option? The only solution to curb this menace effectively is the use of self or auto-retractable syringes. secondly, the self or auto-retractable syringes. In semi-retractable syringes, the user/healthcare worker is required to activate the retraction mechanism of the syringe, so that the used needle may retract within the syringe barrel. 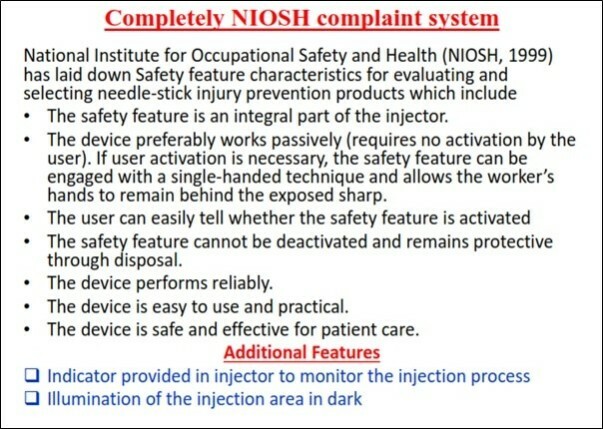 Thus, the retraction of needle is at the option of user/healthcare worker. You may imagine what, if the user/healthcare worker does not care to activate the retraction mechanism? It shall become no better than an ordinary syringe. In self or auto-retractable syringes, the retraction mechanism activates automatically soon after the completion of injection process and their needle is also retracted within the barrel automatically. 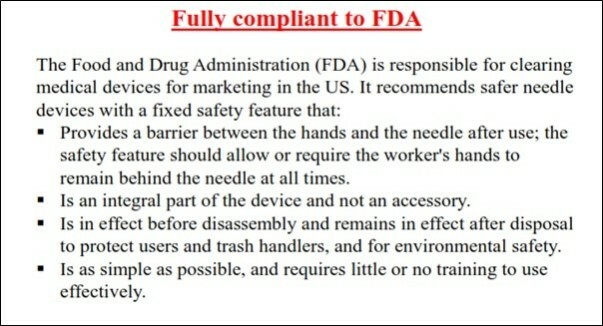 Then, why don’t we use the ‘auto or self-retractable’ syringes? We are even unable to afford the AD syringes, what to say about the retractable syringes. The retractable syringes are several folds costlier than the AD syringes due to the auto-disable and retraction mechanism features incorporated within the syringes. These are affordable merely to a negligible mass (less than 1%) of global population. Thus, the conventional solution is far beyond our reach being very costly. Why the auto-locked self-retractable syringes may not be cheaper? In global state of art the retraction mechanism developed so far is very costly which increases the cost of auto-locked self-retractable syringes several folds higher than the conventional syringes. How can you expect auto-locked self-retractable syringes to be far cheaper than an ordinary syringe when it is additionally equipped with costly auto-disable as well as retraction mechanism?????? Then, what is the cheapest option? Our ultimate mission is to invent as well as innovate a cheapest, safer, greener and user-friendlier technology to completely prevent the reuse of syringe and the Needle Stick Injury, which is the primary source of all dreadful blood-borne diseases i.e. HIV/AIDS, Hepatitis B, Hepatitis C, gonorrhoea, typhus, herpes, malaria, Rocky Mountain spotted fever, syphilis, and tuberculosis and other communicable diseases, claiming more than 40 million lives every year. We wish that the envisioned technology should be equally affordable and accessible for all without creating any technological divide between rich and poor, developed and under-developed or under-developed and poor nations. We have also undertaken to ensure that such technology be readily available at the pace and doorstep of each and every end-user in need. We (the inventors) are the five members of our family. I (Pratibha Rathore) have completed my M.Tech. in Medical Nanotechnology, my younger sister is also M.Tech. in Cognitive Neuroscience and my younger brother is a student of high school. My mother is Medical Practitioner and my father is basically a chemist. Our parents are employed under the Government, whereas we all are unemployed. 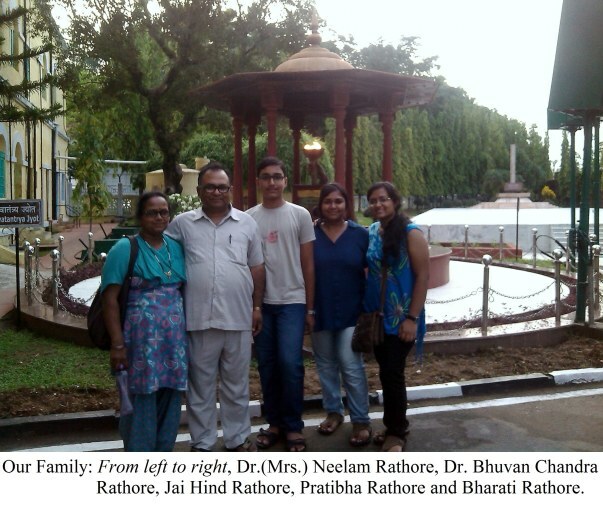 This project is not any part of the assignment of the employments of parents. 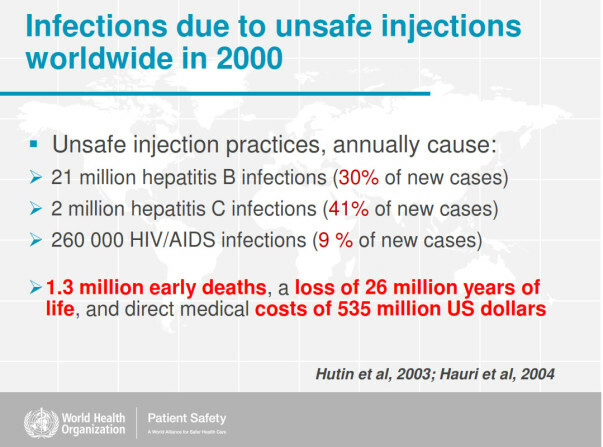 In early 2006, accidently, we came across a report published by WHO entitled “The burden of unsafe injections worldwide: highlights on recent improvements and areas requiring urgent attention”. The report literally shocked us a lot. Such large numbers of the WHO report were not just numbers but precious lives lost to the menace of unsafe injections. We deeply realized our unfortunate plight of being a chronic victim of such a grave threat surrounding us without having any realization. We collectively undertook the report as a missionary challenge to get rid of this dreadful menace. After thorough study, we came to a conclusion that only and only the retractable syringes may be the perfect solution of this challenge, but being highly expensive, hardly 1% of the global population may afford such safe syringes. We continued our persistent endeavors and invested our entire knowledge, skill, efforts, time, money, energy as well as meager resources in designing our dream invention without accepting any kind of financial or otherwise assistance. After a continuous work for about 10 years, we got five International Patent Applications of different designs of retractable syringe published by WIPO. Ultimately, we succeeded in developing this greener, safer, cheapest and user-friendlier solution to get rid of this dreadful menace of unsafe syringes. 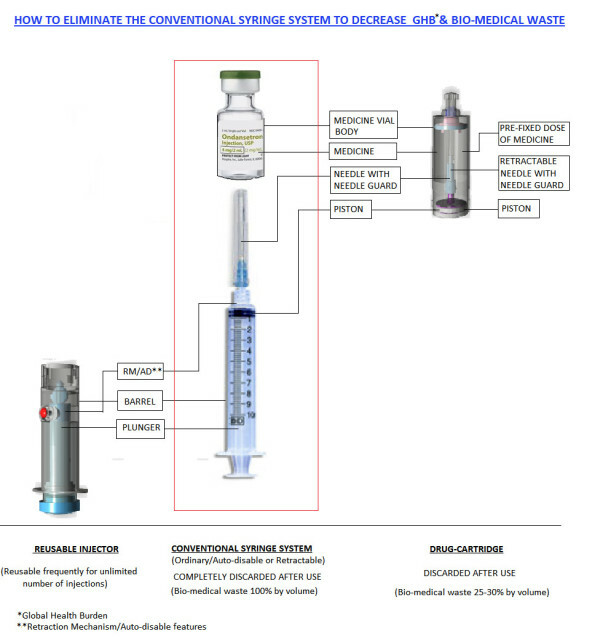 We have seriously dedicated our entire knowledge, skill, efforts, time, money, energy as well as entire meagre resources in inventing and designing our dream invention, ‘The Futuristic Injection System 2020’ to make the injection system cheapest, safer, greener and user-friendlier to completely eliminate the dreadful menace of reuse of syringe and Needle Stick Injury, which are the source of all dreadful blood-borne diseases i.e. HIV/AIDS, Hepatitis B, Hepatitis C, gonorrhoea, typhus, herpes, malaria, Rocky Mountain spotted fever, syphilis, and tuberculosis and other communicable diseases, claiming more than 40 million lives every year. Our current International Patent Application (PCT/IB2016/051060) WO/2016/142799 has recently been published by World Intellectual Property (WIPO) on 15.09.2016, which is available on the WIPO’s website. All the documents are accessible to all and may be viewed by clicking the blue link given in this para. What International Search Authority says about our invention? 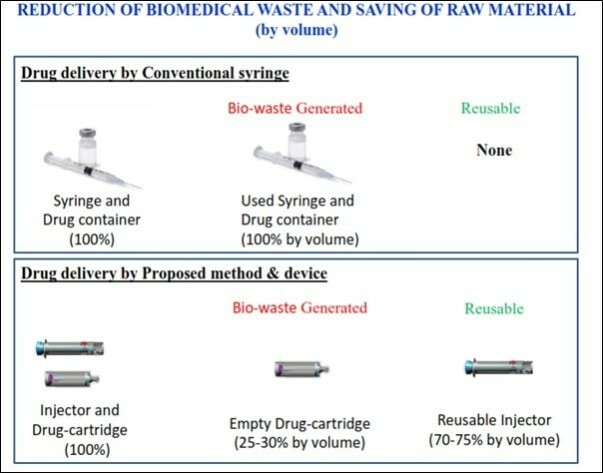 In our disruptive innovation, the drug-container used by pharmaceutical to store and supply the medicine has been utilised as disposable drug-cartridge, wherein drug is packed between piston-head and retractable needle, whereas the costly retraction mechanism along with plunger is incorporated in frequently reusable injector, which makes the injection process at least 80-85% cheaper than the conventional injection system. It ensures prevention of NSI and saves approximately 70-75% raw material and generates only 25-30% non-hazardous medical waste in comparison to the conventional system. The LED feature not only illuminates injection site to facilitate injection during dark hours, but also keeps vigil on complete injection process. The specific features of fluid collector also ensure prevention of NSI. Our invention, recently published by WIPO, consists of a reusable injector and safely disposable drug cartridge, wherein the single dosages of injectable drug are packed between a piston head and retractable needle. Neither of the two parts per se are syringe but constitute self-retractable safety syringe, when both parts are coupled together. The resulted syringe is operable like an ordinary conventional syringe. During injection process, a LED provided in injector switches on to keep vigil on the injection process and to illuminate the injection site in order to facilitate injection safely and conveniently during dark hours too. Immediately after the completion of injection process, the needle automatically retracts and encapsulates inside the empty cartridge, which may be safely disposed as safe and non-hazardous bio-medical waste. On the other hand, the reusable injector achieves original state and becomes ready for next injection. The frequently reusable injector comprised of an efficient retraction mechanism along with a plunger shaft, which couples with the piston head of drug-cartridge during the injection process and actuates the plunger shaft to facilitate safe drug-delivery. On completion of injection process, it releases the piston head of drug-cartridge. In this invention, the drug containers i.e. vials, ampules etc., which are ultimately discarded as waste, are used as a disposable drug-cartridge containing single dose of medicine along with hypodermic needle, hence it constitute a smart packaging material to pharmaceutical industry. Of course, it will increase the packaging cost of medicine by 15-20%, but will eliminate completely the need of separate syringe for injection process. The end-user will have to pay only for increased packaging cost, not for the cost of injector each and every time. Since, the injector is frequently re-usable; its cost shall go on decreasing with each and every injection performed with the injector, which shall become quite negligible after a particular time. Thus, the end-user will have to pay only a very small or negligible amount for the increased packaging cost of drug in the form of drug-cartridge in place of separately purchasing a costly safe syringe for each and every injection process. 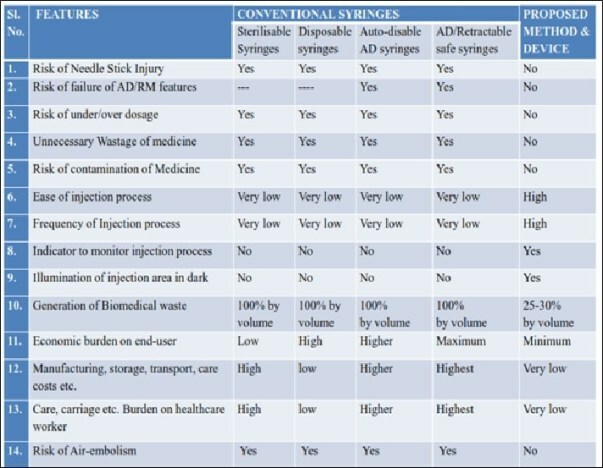 We have fairly estimated that on adapting our proposed injection system, the overall cost of conventional injection process performed with the help of costly safe conventional syringe shall reduce to 80-85%, because the user will not be required to purchase a separate syringe for injection process. The disposal of empty drug-cartridges will generate only 20-25% safe non-hazardous waste as compared to conventional injection system, where the empty drug container and the used syringe both are discarded after use. It will not only save the entire investment put in manufacturing of the conventional syringes i.e. raw material, energy, labour, skill, manpower, storage, transportation, distribution, sale etc., but also will dramatically decrease the growing mountains of hazardous bio-medical waste generated due to the unsafe disposable syringes and empty drug-containers. As discussed earlier, pre-defined single dose of the injectable medicine will be packed by the pharmaceuticals in drug-cartridge. The user/health care worker mounts the drug-cartridge on the injector to constitute a self-retractable safety syringe. The user pulls out the hypodermic needle by pulling the knob at the forehead of drug-cartridge and removes the needle guard to expose the needle. The syringe becomes ready for injection process and may be operated just like an ordinary syringe. Immediately after the completion of injection process, the needle automatically retracts and encapsulates inside the empty cartridge, which may be safely disposed as safe and non-hazardous bio-medical waste. On the other hand, the reusable injector achieves original state and becomes ready for next injection. This novel feature has been introduced very first time in the history of syringes. As soon as the user begins operating the injection process, a LED provided in injector automatically switches on to illuminate the injection site in order to facilitate injection safely and conveniently during dark hours. The LED turns off with completion of injection process. It also keeps a close vigil on safe injection process during the entire course of injection. Besides, it confirms that the injection process is successfully accomplished and the full dose of medicine is successfully injected completely. It provides a cheapest, greener, safer and user-friendlier substitute of conventional safe syringe, which is easy in handling/operation without any requirement of formal training to the healthcare workers/users. It completely eliminates the need of conventional syringe for drug administration, thus saving entire raw material used in manufacturing conventional syringes. It decreases the cost of injection process to make it cheaper (at least by 80-85%) in comparison to the conventional injection process, which essentially needs a separate safety syringe to administer each and every dose of medicine. It curtails the generation of at least 70-75% of hazardous bio-medical waste and produces merely 25-30% of safe and non-hazardous biomedical-waste. It provides all necessary features of an efficient retractable syringe by eliminating requirement of users intervention, extra pressure to activate/trigger the retraction mechanism and probability of premature retraction or failure of retraction mechanism etc. to ensure Needle-Stick Injury reduced to zero. The glow of LED indicator during the injection process confirms the completion of injection process creates awareness in patients relating to handling of injection process by healthcare workers/users and also facilitates safe administration of injection during the dark hours. The packaging of drugs in proposed drug-cartridges will completely eliminate the contamination of costly life-saving drugs, which is caused by a considerable extent of entrapped air volume along with the drug for a long period in conventional drug-container. Such entrapped volume of air at least contains nitrogen, oxygen, carbon dioxide, other gases etc. (if not the other air-borne pollutants/ contaminants), which continuously interact with drugs stored in conventional vials ampules etc. to deteriorate drugs quality and efficacy adversely during entire course of storage, since packaging to the final use. The packaging of drugs in proposed drug-cartridges will preserve and maintain the original efficacy of drugs for long period of time. It completely eliminates the need of separate packaging material i.e. ampules, vials or the like containers to preserve, store and supply of injectable drugs. It completely eliminates all the probabilities of contamination of medicine, which occur during the transfer of drug-contents from the drug-container to the syringe for injection process. It completely eliminates the unnecessary wastage of costly drug in two ways: (i) the drug contents go waste during its transfer from drug container to the syringe. (ii) Sometimes, the drug container contains 5-10 dosage but only few dosages are utilized and the rest are discarded by health worker. It completely eliminates all the probabilities of administration of under-dosage and over-dosage medicine into the patients as each and every drug-cartridge shall contain a pre-defined/fixed volume of dosage and during the process of injection, complete dose shall transfer into the patient without any kind of user-intervention. It completely eliminates all probabilities of reuse of used/discarded syringes because syringes are no more required for the injection process. On the other hand, reuse of drug-cartridges is not possible being the re-use more costly than the original product. It ensures reduction of weight and volume of syringes per dose carried by health workers in work-field and also reduces the burden of care on them as they require carrying only the desired quantity of drug-cartridges bearing desired volumes of dosage and couple of pen-type injectors in the field. It automatically reduces the overall expenses incurred on the packaging, storage, transport, carriage etc. to a very high extent. It saves the invaluable time of user/healthcare worker because the proposed method shall increase the frequency of administration of injection process by several-folds. The innovation, if adopted and used globally with full swing, it will reduce the rapidly increasing exorbitant Global Disease Burden (GDB) as well as Global Health Burden (GHB) to a very high extent. The proposed technology being cheapest in comparison to the existing ones is equally affordable and accessible to all world-wide and hence may not impart rather bridges the technological divide existing between rich and poor. It is fully compliant to guidelines laid down by WHO, FDA and NIOSH. Complete elimination of syringes will ensure prevention of abuse of injectable drug. It provides a green, safer, cheapest method and device for sustainable new drug delivery system. It will make the healthcare equally as well as easily affordable and accessible to all. It will help in promoting the democratization of healthcare sector. It saves 70-75% of raw material from becoming hazardous waste. The end-user won’t need to buy syringes anymore. It promotes ‘Single dose-Single use’ campaign. It prevents wastage of expensive drugs by increasing its reachability to end-users in need. Multi-fold benefits to healthcare sector by making the injection process greener, cheaper and sustainable one. It completely eliminates the hazardous bio-medical waste generated by disposal of conventional syringes. It reduces all the costs and resources incurred in waste management of syringes. It negates all the hazardous consequences of syringes ranging from oceanic plastic pollution to climate change. It will zero-down the carbon footprint of syringe industry. It reduces the consumption of raw plastic material to a large extent. It solves the issue of solid-waste management in rural/urban areas by reducing the medical waste generation by 70-75%. It shall prove immensely helpful for the developing and under-developed countries in achieving their Intended Nationally Determined Contributions (INDCs) and in fighting the grave challenges of climate change. The affordability of invention will prevent the existing technology divide between rich & poor, developed and developing/under-developed countries. It effectively addresses the growing menace of drug abuse and illicit/counterfeit injectable drugs. It will effectively reduce the growing number of cases HIV/AIDS, Hepatitis B, C etc. thus, effectively reduce Global Disease Burden as well as Global Healthcare Burden. It will also prevent physical, mental, emotional and psychological trauma especially among women and children by preventing NSI causing spread of HIV, Hepatitis B,C etc. popularly known STDs, that are social taboo especially in Third world countries. The significant reduction in the global healthcare burden (GHB) will generate huge financial saving for countries that can be utilized for the holistic development of humankind. The reduction in Global Disease Burden (GDB) due to unsafe injections and medical waste will improve quality of our life with significant increase in our life-expectancy. It will effectively protect, safeguard and ensure safe and dignified ‘Right to Life’ to all. It will ultimately help in achieving WHO’s initiative of replacing the conventional syringes completely with proposed safety syringe by 2020, to reduce the menace of NSI almost to zero. The proposed innovation will also help the developing and under-developed countries in meeting requisite Sustainable development Goals (SDGs). What is the need of the day? It is a most urgent need and pressing demand of the day to save our pioneering technology from the clutches of unscrupulous profit-mongers and to put it on full scale commercialization worldwide, so that the ultimate benefits of this innovation may directly reach to the end-users in urgent need. We have already mentioned that we are “five family members (parents and children)”, who have been continuously engaged in developing this technology since 2006. Out of five family members, three of us are unemployed, nevertheless, pursuing this project zealously with full endeavors by utilizing all our personal meager resources without obtaining any kind of external financial support. Our parents do also have no any kind of employment obligations in connection with this project work. Soon after the publication of our invention, we most humbly, cheerfully, and voluntarily proposed to offer a free of cost unconditional license to WHO, UNICEF and RED-CROSS to make, distribute and effectively utilize our invention in all jurisdictions worldwide for the welfare of mankind, so that the ultimate benefit, if any, may directly reach to the end-users in urgent need. We do also, most sincerely and respectfully, appeal you all kindly to contribute us generously to keep our conscious efforts continue for further R&D and enable us to secure IPRs, which are essentially required to save our endeavors from the clutches of unscrupulous profit-mongers, so that the real benefits may directly reach to the end-users in urgent need. Your generous support and kind co-operation in this regard shall encourage us a lot. We shall be anxiously looking forward your kind response. How shall we utilize the funds collected from you? We most sincerely and consciously assure you that we shall honestly, judiciously and legitimately utilise each and every single penny of your hard-earned donated money in pursuing our endeavours relating to further R&D of our invention and to secure our IP rights to save this technology from the clutches of unscrupulous profit-mongers, so that the real benefits may directly reach to the end-users in urgent need.